If you have a visually significant cataract, the only way to regain your clear vision is to remove the cataract surgically. Often you can also choose to limit your need for glasses with the use of our Toric and Multifocal Lenses. 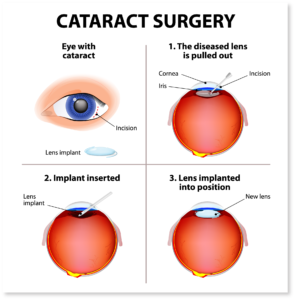 You and your cataract surgeon will discuss this and other aspects of the surgery. How Effective is ORA-Guided Cataract Surgery? Compared to traditional cataract procedures, ORA-guided cataract surgery is proven to significantly improve your visual outcome. What Types of Intraocular Lenses (IOLS) are Offered for Patients? Standard intraocular lenses called monofocal IOLS are used for patients who don’t need or want to correct other vision problems such as astigmatism and presbyopia. These lenses will provide you with excellent visual clarity, but glasses or contacts will still be needed sometimes with the use of a monofocal lens. Our cataract surgeons and surgical coordinators will discuss our premium options with you. These include multifocal IOLS such as the ReSTOR® or Technis multifocal and the astigmatism correcting IOLs called Toric lenses. You and your physician will discuss if you are a good candidate for cataract surgery. Generally when the cataract impairs the vision enough to cause difficulty reading, watching television or driving then cataract surgery should be considered as an option. A comprehensive eye examination will determine if a cataract is the cause.